The student-directed learning approach builds on extensive high quality education research. We refer the reader to a book called Powerful Learning: What We Know About Teaching For Understanding , edited by well-known researcher Linda Darling-Hammond (Jossey-Bass, 2008). Darling-Hammond reviews more than 50 years of education research that focuses on teaching students to fully understand so they can apply that understanding effectively to new situations. This leads her to a family of authentic, hands-on approaches that she describes as inquiry based, but are often called project-based learning, design-based learning, or problem-based learning. The studies overwhelmingly demonstrate much deeper learning and understanding for these approaches. However, they also point out the challenges for educators to effectively implement inquiry-based approaches. One study, for example, says “it takes significant pedagogical sophistication to manage extended projects in classrooms so as to maintain a focus on ‘doing with understanding’ rather than ‘doing for the sake of doing. '” This reflects the fact that many teachers have used projects in one form or another as part of their instruction, but that is very different from true inquiry-based or project-based learning. Students at the Deeper Learning schools achieved higher scores on all three components of the PISA exams (reading, math, and science) and also on the respective state English Language Arts and math exams. Students at the Deeper Learning schools reported higher levels of collaboration skills, academic engagement, motivation to learn, and self-efficacy. Students from Deeper Learning schools were more likely to graduate on time (in four years), with a graduation rate estimated to be about 9% higher than for the comparison schools. During a visit to Deeper Learning School Manor New High School, near Austin, TX, the principal shared extensive official state performance data highlighting the success of the learning approach. 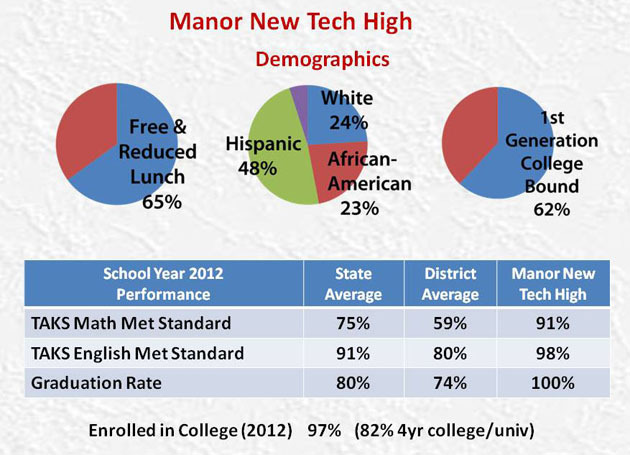 Manor New Tech is a special district high school started in a low income community just outside Austin. Founder Steve Zipkes was charged with finding a better way to educate kids when the district’s regular high school was failing badly, and he chose to go with a 100% project-based learning approach. This data summarizes the demographics of the school and how well the students are performing compared to the district and state averages. 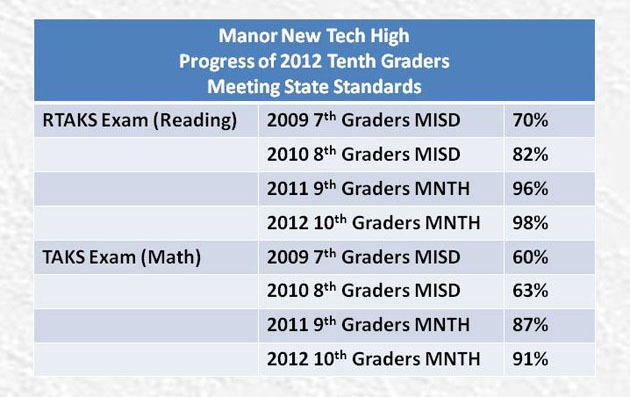 Even more interesting, Steve tracked the data of the students in his 10th grade class as they progressed through the regular Manor Independent School District Middle School into Manor New Tech High. One can see the clear jump in the number of students meeting the Texas state exam standards after coming to MNTH.